Woodstock 50 : Unearthed 60” x 48” acrylic and mixed media on wood panel. I was fourteen years old and could only salivate after the thought of what had transpired in the summer of '69. An entire generation was going to the moon. Everywhere was a song and a celebration. The jet bombers turned into butterflies. We were stardust. We were Golden. Was that it? Was that our School of Athens moment? Was that truly the dawn of a new age? Today, the only line that seems to ring true is credited to the WHO: .......same as the old boss. We did get fooled again, and again. I painted " Woodstock 50: Unearthed " as an archaeological fragment, a slightly worn out figment of my imagination dug out of the fondest rose-coloured memories of a youth who waited in the wings, watched longingly from the sidelines. Too young and Catholic to truly participate, but old enough to know what was going on. Fifty years on, I wouldn't trade my vantage point for the world. I gave it a passing thought that summer-how could I possibly get there, and how much would it cost? But I had to work. At my grandfather's grocery store. Didn't stop me from dreaming about it, though. Plus it was in New York. My dream will have to do. 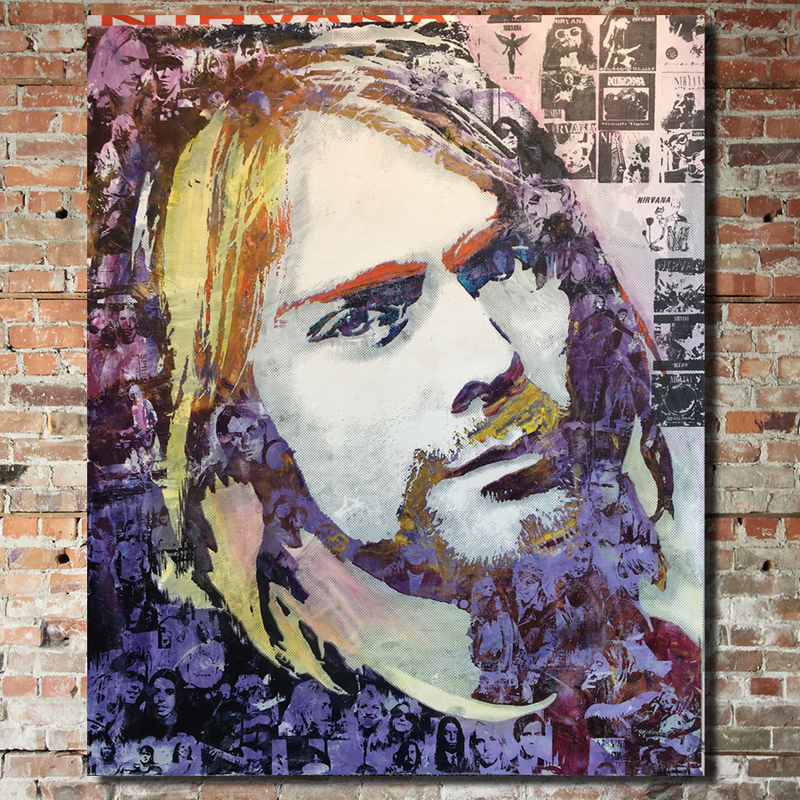 "Woodstock 50: Unearthed" , mixed media on wood, 48"x60" by Pietro Adamo. Exploration and Discovery are the two circular pieces currently receiving much attention. True, the circle seems to be all the rage today as a preferred shape, and spheres can be seen as part of, or central to art installations in many exhibitions. My decision to fill the circles with simple, fragmented patterns came as a result of where my mind always goes when confronted by the wonderful circle: globe, universe, exploration, discovery, and archaeology. I have worked within the framework of the circle many times, and always, I tend to feel the allure of new boundaries, and no boundaries. For Exploration and Discovery, I went back to the fragments of pottery excavated and displayed in the museums of Athens, Rome, Madrid, London, Sicily and Crete. The worn finishes from frescoes in Iraklion and Pompeii. These seemingly simple patterns can be found around the globe. The simple geometry acts as a universal visual language, like music for the eyes. These patterns link us more than we might give them credit for. They can be found anywhere: On clothing, on utensils, as architectural motifs in government buildings or wooden huts- in temples, cathedrals or primitive worship circles. They randomly appear, and practically everywhere on the planet, in every culture, in some form or another. Humans have been discovering and re-discovering these patterns as if they all were mandalas. Universal visual truths perhaps. Perhaps they tell us more about our similarities than our differences. Wherever you go- there you are. We’re pleased to announce Pietro Adamo’s first Solo Show of the year at Brights Gallery. For more information send us a message with the provided form. 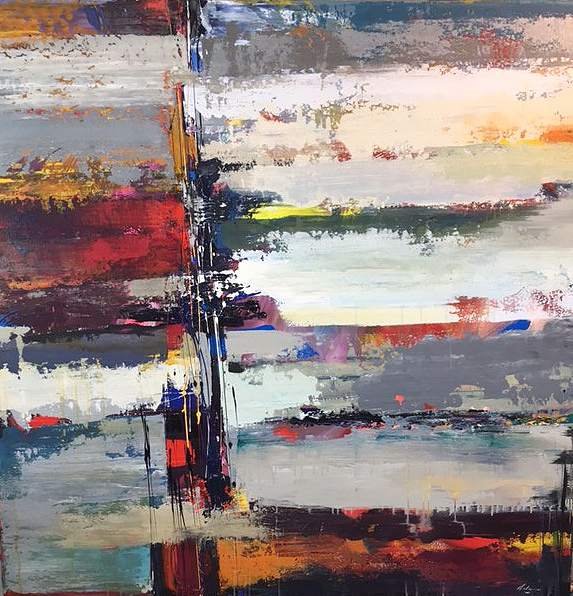 Inspired by the natural beauty of the west coast, today’s Showcase Piece is “Monterey”, a 44” x 44” Acrylic and mixed media work on canvas. For more info on Monterey, contact Erica (Head Curator) with our provided form. 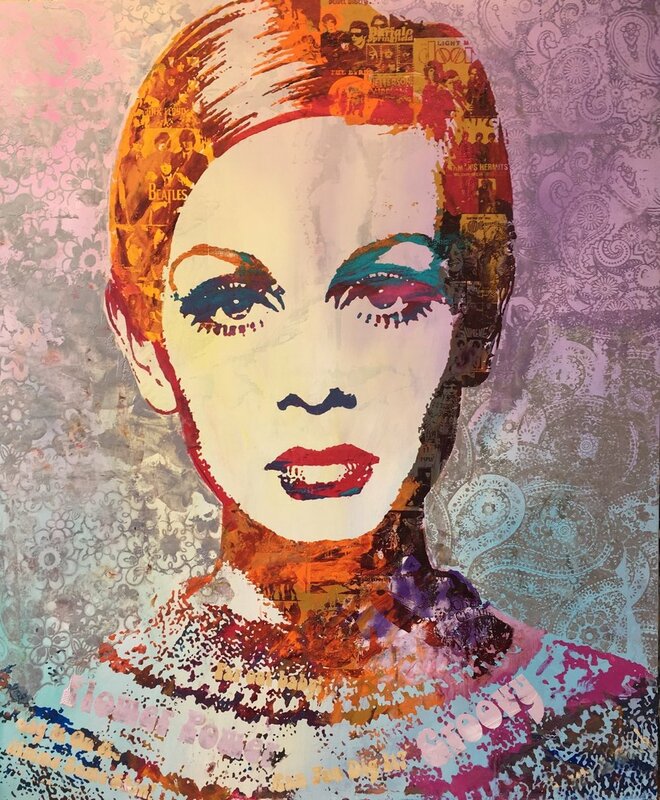 We are proud to showcase “Chantilly”, a beautiful 44” x 44” acrylic and mixed media piece, painted on 1.5” gallery stretched canvas. For more info contact Erica (Head curator and Studio manager) with our provided form. Once a year, during the Bloor Street Entertains CANFAR event, Toronto's heart shines a little brighter, and beats a little stronger. Erica and I were privileged to attend the annual dinner and after party held at the Four Seasons Wednesday evening. I have been donating art to this charity for a number of years, and the cause is supported by so many of Canada's who's who. The well-organised event centred around a silent auction in which two of my icon pieces were grabbing much attention and bids. "la Bionda D'oro (Marilyn) and Joan of Art (Gaga) did their part in raising funds. The best feeling one can have is that of giving a helping hand, and knowing that we have contributed in some capacity drives home the true purpose of this life. Add one hell of a party, and well, it's all good! Heartfelt thanks to our friend Logan and all the people who work hard to put together such a classy affair! May the money raised continue to help in the fight and continue to bring some comfort to those who suffer. For all those who missed the show, please enjoy this short video. 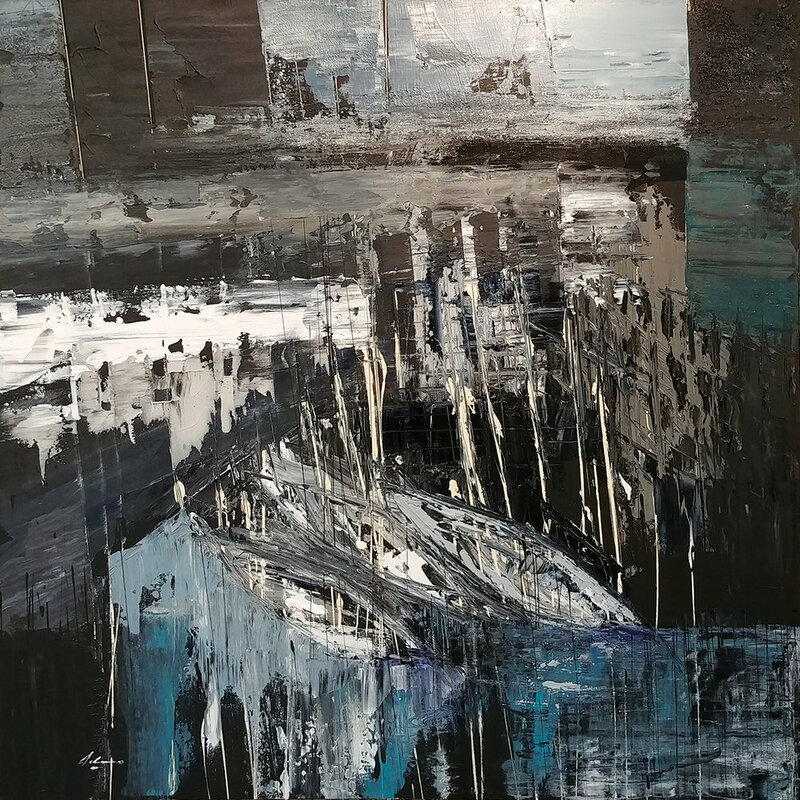 We’re proud to introduce 2 new works by Pietro Adamo. These beautiful abstracts are part of the Hanstone series of works. For more information please contact Erica at the studio with our provided form. It's just cool to paint on a circular panel or canvas. It's even cooler when the circular panel is part of the statement. 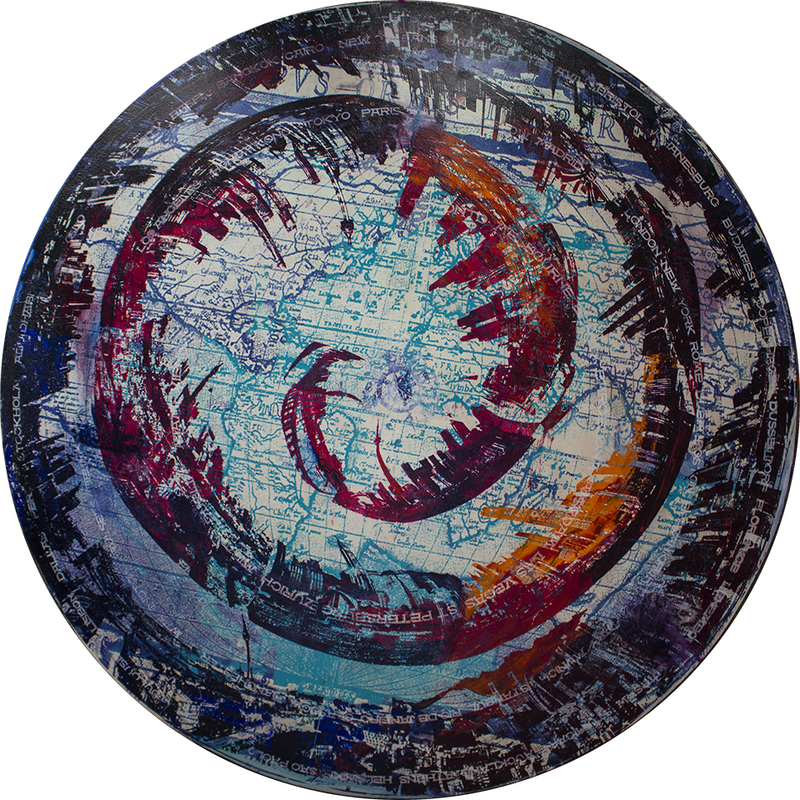 New Atlantis (6' circular panel, acrylic on wood, 2018, HanStone collection, Vaughan, Ontario) was meant to be painted on a circle, with subtle use of colour to create the suggestion of a sphere or globe. My view of the scope of HanStone's enterprise grew clear as I researched the company, its product and the attitude of its staff. I knew the piece would be there to reflect a time-honoured tradition of international cooperation in enterprise. It would have to speak of quality, of the past, present and future. It would have to somehow indicate the modern pace, but with roots in the global visions of the early explorers. It would have to, after all was said and done, still be an Adamo. As I overheard business dealings going on in the beautiful showroom via portable device and at a seemingly calm pace, I realised I had stumbled into the future of enterprise (all this without eavesdropping, I swear). Confidently and calmly, these young Hanstonians were communicating with the world and trade was happening. Exchanges of all kinds. In an instant, material quarried and refined in Canada could be allocated to practically any destination on earth. I was transported back to my childhood and to my library books of choice :"They Put Out To Sea", "The Golden Hind" and "Explorers". I was quickly engulfed by the notion that there could still be a romantic and noble side to the idea of global enterprise and collaboration. The piece, then, would have to cause one to pause and reflect, and perhaps discover something new in it every day. A reminder of the brighter, bigger picture, and of how cool it is to be part of it. It would have to be as polished and beautiful as the quartz itself, and quietly command attention unto itself. It would have to inspire confidence. It would look to the future without compromising the present or revising the past. And since a picture is worth a thousand words, it would have to be a work of art. Dedicated to all who still aspire to building a better world. And so it ends. And so it begins. Two days after what turned out to be the most important show of my career to date, the social media buzz is still going. Go figure. A light-hearted approach to a show meant to entertain and be a part of the "ticket" became the show in which I actually witnessed people truly engaged in looking and discussing- actually taking in and digesting- the art. My art. Their art. They looked, they read and they even touched- ART. The space is so, so cool. As the HanStone Soiree ended on Thursday evening, I was hearing the final note of A Day In The Life in my head. As the sun rose this morning, the Verve's Lucky man was playing. Humbled. Honoured. Entrusted. Fire in my hands. The Horizon seems far away this morning. Keep swimming, I tell myself. You'll never get there. Ahh...but the journey...the sweet journey. A journey fuelled by love. Friends and family. Laughter. Sorry, no stories of angst and anguish here (although if we really wanted to dig deep...). I got this from many people at the show: "It's all positive, uplifting, and still so interesting..."
Alrighty then, it may have been just the atmosphere and the wonderful music or maybe my uncle's fabulous wine. But if that's my mandate, I'll take it. Engaging people, making them feel positive...there have been worse fates. The art of my past, my present and my future got together for one evening and left me alone at the crossroads with a single direction. Deepest gratitude to all those involved. Talk about a week of Gratitude! I had the great pleasure of delivering two Giardini which were commissioned by two wonderful couples. In both cases, the Giardini were gifted to each other, and were agreed upon by both partners as art that they both respected, admired and desired. Talk about humbling. One couple is here in Toronto while the other resides in Montreal. You could say they are in comparative areas, and although they had slightly different décor- both homes seemed to resonate with tranquility, and confidence. Collectors of Giardini love their pieces. It's quite something to bear witness to the reactions. It has become an important component, like the moment I place a mark on a blank canvas. Anticipation and nervousness are intrinsic to both events- heaven forbid should the stress disappear- it would be the end of the creative journey, I think. I carefully explained to one of the them that Giardini were not a study in landscape, or a lesson in botany- I cannot tell a geranium from a hibiscus- Giardini are the product of my imagination. Intensely personal. As they unwrapped the pieces to their delight, I too, after seeing them lifted to the wall space provided for them, thought to myself: "Gee, this painter must be in a pretty good headspace"
Someone once pointed out to me that it would be impossibly difficult to part with paintings because they are like your children. Okay, I get it. But children do have to leave the nest sooner or later, and it's nice to know they've found a good home. To the two families which will be celebrating this Thanksgiving as owners of Giardini: Erica and I wish you the very best, and may the pieces always bring you to a happy place whenever you take time out in your day to simply escape. And so evening fell as we left Pensiero Bello in the beautiful East Toronto home. We were wowed by the dignity and class of the people we just met. Two mornings later, in beautiful West Montreal, we experienced the same feelings as we left Nuova Gloria in its new home. We were having dinner in Ottawa later that evening when we received a timely text stating that they couldn't take their eyes away from the art. Just before the sun set on a serene autumn evening, Erica noticed a wall of colour formed by the trees on the banks of the Rideau: "Look at that, it's as if you left a Giardini out there"
Happy Thanksgiving. May we all count our Blessings. The more I travel, the more I come back to Canada. In gratitude. More than ever, I feel the need to thank my parents, and my grandparents before them, for the sacrifices they made. A glimpse into the art and culture found here, whether First Nations, or Founding Nations reveals the deepest influences in my art. My Italianita is only a part of who I am as a painter. The rest is comprised of undeniable influences of the works of the artists who have surrounded me since childhood. Groundbreakers, giants, courageous and bold- even in their portrayal of serene quietude which can only be found in this land. From The Group of Seven, to Les Automatistes, to Morrisseau- to the Magic Realism of Colville and Pratt, and finally to Michael Snow, Weiland and Shadbolt- they have all crossed my path. There are too many to mention. In Baie St. Paul, where painting is a religion, the streets are packed with tourists on a warm, sunny July afternoon. So too are the many little galleries. In La Malbaie, the centrally-located "commercial" gallery is packed with visitors. The proprietor/curator is charming, professional and certainly knows her stuff. I turn to the paintings and realise that these are not just Quebec artists. Reps have been coming here for years without so much as being able to place a single piece from an artist outside of Quebec. Something has changed. This gallery represents the new rule, and not the exception. The positive energy in the space is palpable. The spirit of Canadiana is in full-force here. All you have to do is look at the art. Every living Canadian artist owes a debt of gratitude to those whose works now fill our public galleries and spaces. There is a strong legacy here, as famous collectors like Steve Martin have attested to. Our use of texture, our colour, or perception of space (as vast as the land), our light- unmistakeable. I see it in the work of my contemporaries. I see it in my work. Is this the longest run? Are the markets real? Is the big bad bear around the corner? The relentless pursuit of money is symbolized by the powerfully beautiful bull. Renowned for its strength, it sometimes is very vulnerable as witnessed by many a matador. Those who lose respect for the Bull however, are oftentimes surprised by being gored just before they raise their sword in ghoulish pride in a moment of perceived glory. If you're off running with the bulls figuratively or literally, please be careful! They make a fine mess, don't they? I have the peculiar habit of allowing my kids to "borrow" my paintings. The pieces are safely kept on the walls of their lovely abodes, and no doubt they have become the focus of many a conversation. Some of their favorite "masterpieces" have acquired, I'm told; "squatter's rights" simply by being in place for so long. So good luck, Mr. Adamo in retrieving them any time soon. After all, "Pa"and Nonno now, there's no room in your studio! Our daughter and our son have been constantly surrounded by art, and have a deep-rooted appreciation for it even though their careers are not entirely art-related. ( Their spouses have ingested the "art bug" by default, it seems). They have become, I must say, respected, upstanding members of society and very proficient at what they have chosen to do. I told them they could still rebel if they want to EVEN IN THEIR LATE TWENTIES! Not in the cards. Thank God for their mother. Sitting in the family room of my son's home, I stare at Cordoba, a painting which was completed during a period of time when our children came of age, so to speak. I painted it at the request of the late Harvey Kaleff, a wonderful man who ran a company called Brushstrokes which held a patent on a process for textured reproductions of paintings. The only specific request was that it be an abstract piece which would "blow their socks off ". My guess was that he wanted it to resonate. It did. To the tune of well over 300,000 pieces worldwide. The stuff of retail lore. As I stare at the original Cordoba, I am taken by the power of art, and how it can transport us in time. I am humbled by the thought of just how much it has meant to our family, and how rare a privilege it is to continue to pursue it. 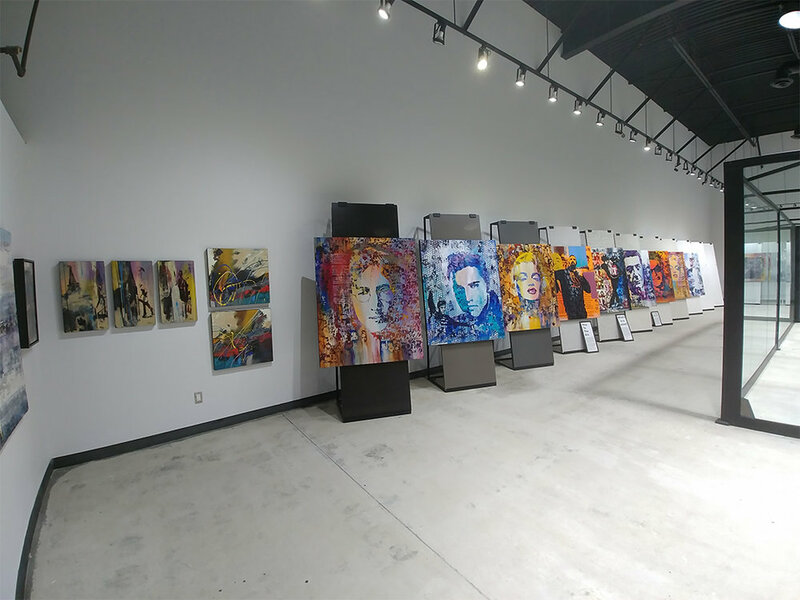 I am grateful for all of the collectors and supporters of my work who have made the journey possible. My obligation is to my art, and as such, to you, my audience. It has come to my attention that people are "waiting" to see what "Adamo" does next. You see, I too am awaiting to see what Adamo does next! ADAMO is my 9 month old grandson (Adamo Rocco Russo, b. Sept 25, 2017). Look for his influence to be in all of my future work. It's gonna be amazing!!!! Ahhh here comes the Summer-enjoy!